The All Stars moved quickly to take control of the first bout right in the first half. Offensively, they controlled the lead jammer position seventeen times and very effectively used this advantage to cause the half to be a marathon campaign of 25 jams. Combined with an impenetrable defense, this set the tone for the rest of the evening. The teams traded lead jammer positions in the first two jams and each warmed up with a few points, leaving the score 4-3 at the end of the second jam. Ohio then took control with twenty-five unanswered points in four jams, which featured an apex jump in the sixth by Zee “Loraine Acid” Gulertekin. The SufferJets’ key offensive player, Nora Morse, failed to capitalize on holding lead jammer position in the seventh with only a three point pickup, which was immediately answered by Ohio's Lora “Outa My” Wayman's triple grand slam 19-point run in the eighth. Despite controlling the lead jammer position for three out of the next four jams, Ithaca scored only 11 more points. Both teams inched forward through the seventeenth jam, only scoring 26 points between them in a defensive endurance match that ended with a 74-23 score. Ohio controlled the lead jammer position for the next seven jams and held Ithaca scoreless. Two track cut penalties in the twentieth and twenty-third jams by Ithaca jammers AKT*47 and Jagger both gave Wayman a power jam, and she translated both into multiple grand slams. The score stood at 118-23 going into the twenty-fourth jam and the last two jams of the half turned somewhat chaotic. Ohio's Blitz Lemon went into the twenty-fourth with a power start, but only translated that into four points before catching herself a seat on the pinewood penalty bench. This gave Ithaca's Nora Morse a power start with only the jam clock remaining. She picked up six points before getting her own penalty as Blitz Lemon returned from penalty purgatory to power jam with a vengeance. The last jam was hard fought with the final four whistles of the half sounding while Blitz Lemon was mid-air and mid apex jump. The score was 132-29 at the half. The Ohio All Stars brought more offensive firepower in the second half. A total of seven players wore the star at different times, with five of them in regular rotation. Ithaca only had three jammers in rotation, and despite repeated attempts at star passes, fatigue began to take its toll on their offensive capacity. Ohio players held lead jammer status for 15 out of 21 jams and used this to control the tempo of the bout effectively. Right out of the gate, The Smacktivist picked up six points in the first jam. Blitz Lemon followed Mack in the second with 12 points, apex jumping for the last two, landing on the ground and calling the jam from there. During the fourth, The Smacktivist pirouetted, dodged, bobbed, weaved, and powered their way through a power jam for five grand slams and twenty-nine points. The next two jams featured big offensive plays by Chainsaw and Big Rigg, each picking up double grand slams with additional points on the side. Zee “Loraine Acid” Gulertekin picked up another three points in the next jam, rounding out seven straight jams with Ohio controlling lead jammer at 211-33. The eighth jam saw Ithaca's Rainbow Might take the lead jammer position but remain scoreless while Kitty Liquorbottom said a three-point “hello” for Ohio. During the eleventh jam, with Rainbow Might again holding the lead jammer position, Zee “Loraine Acid” Gulertekin forced a call off from the back of the pack with hip-checking jammer on jammer violence. This would be the second time Rainbow Might held the lead but was held scoreless. The next two jams both started with Ohio having a 4-2 pack advantage at the opening whistle. Bigg Rigg scored twenty-four points for the black and green machine in the twelfth. The thirteenth was unlucky for Ithaca and pivotal for Ohio. Chainsaw fell a point shy of tying Bigg Rigg's previous scoring jam. Ithaca only picked up three points with a star pass between Nora Morse and Manda Tori Chaos. Meanwhile, the SufferJets’ team captain, Gorges Curves, fouled out and the jam ended with a decisive Ohio lead of 267-38. The winning momentum dissipated somewhat after a star passing thirteen-point power jam that Blitz Lemon and Burnadeath tag teamed during the fourteenth. Ithaca controlled the next three jams, holding Ohio to four points but only picking up thirteen. Ohio responded by holding Ithaca scoreless for the last four jam as Zee “Loraine Acid” Gulertekin, Wayman and The Smacktivist combined efforts to add twenty-eight points, closing the bout with an astounding final score of 312-59. A series of Green on Blue incidents. The B-team match up between Gang Green and the Ithaca BlueStockings was not as lopsided on the scoreboard as the charter team bout, but it was still a clear victory for Ohio. There were also more penalties on both sides, with ten offensive penalties called on Ohio jammers and nine on the BlueStockings during the bout. Penalties were a factor from the opening whistle. The first jam saw Ohio's Paige Bleed pick up three grand slams during a power jam before spending time in the penalty box herself, while Ithaca's Machete and Meatballs picked up ten points during her own power jam with a 4-2 pack advantage due to penalties. TactiGal was quickly forced to call off the second jam before scoring, as the Ithaca jammer was on her heels, but Karmabal Lectur reinforced Ohio's lead to 27-14 in the third. The BlueStockings held the lead jammer position for the next three jams but translated that into only 12 points. Ithaca briefly held a 30-36 lead at the end of eighth jam during which Gang Green's Betty T. KayO caught two trips to the box. Ohio then stormed back. Karmabal Lectur got a penalty in the ninth but scored a grand slam before it and seven points after. Paige Bleed widened the lead in the next jam with a 12-point pickup and Ohio jammers held lead status for the rest of the half. Gang Green inched the lead forward by twenty-four points while holding the BlueStockings scoreless until the seventeenth jam. Really wild play began there, with Val Holla's scoring pass being cut short and Ithaca attempting to regain momentum with a star pass from Machete and Meatballs to Riptide. The startling play ended with a track cut penalty. The last two jams of the half began with a Karmabal Lectur power start, leading to a triple grand slam which Paige Bleed mirrored with her own triple in the nineteenth and final bringing the score to 135-66 at the half. The second half began with a methodical 30-1 advance by Ohio over five jams. Both teams attempted to roll to a breakout in the sixth but Ohio was more successful. TactiGal's power jam yielded a total of three grand slams, yet she ended the jam on the penalty bench, giving Ithaca the first of two consecutive power starts. Gang Green responded both times with star passes to (first) and from (second) Garden of Beatin'. 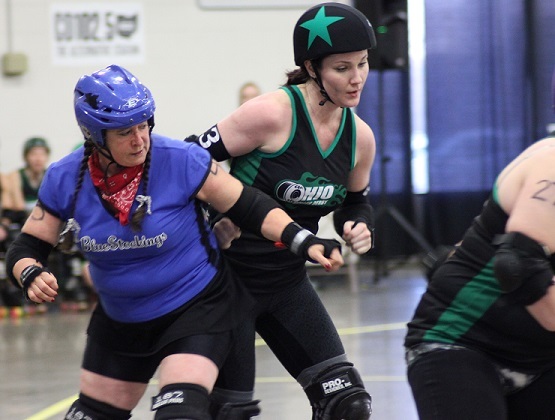 The depth of Ohio's bench was revealed over the remaining twelve jams as three additional jammers--Bruss Knuckles, Sarah Sexton, and Lil Spitfire--were added to the rotation. Ohio extended their lead by three points over the next six jams to 221-112 despite Ithaca having lead jammer status for four of them. Both teams then really turned on the offense for the next two jams. It began with Ithaca's Rose Hips passing the star to Jagger and the latter getting two grand slams in the fifteenth. During the same jam Garden of Beatin' rolled to an impressive 28 points of her own. This high scoring jam was followed by Machete and Meatballs scoring 23 points in the very next jam. The offensive resurgence on both sides quickly morphed into mostly defensive play to round out final three jams, with the total at 268-147 in Ohio's favor at the final four whistles.